This is the new book cover I created for an online workshop I am taking. The class is "You Think You Know Me?" by Shimelle. 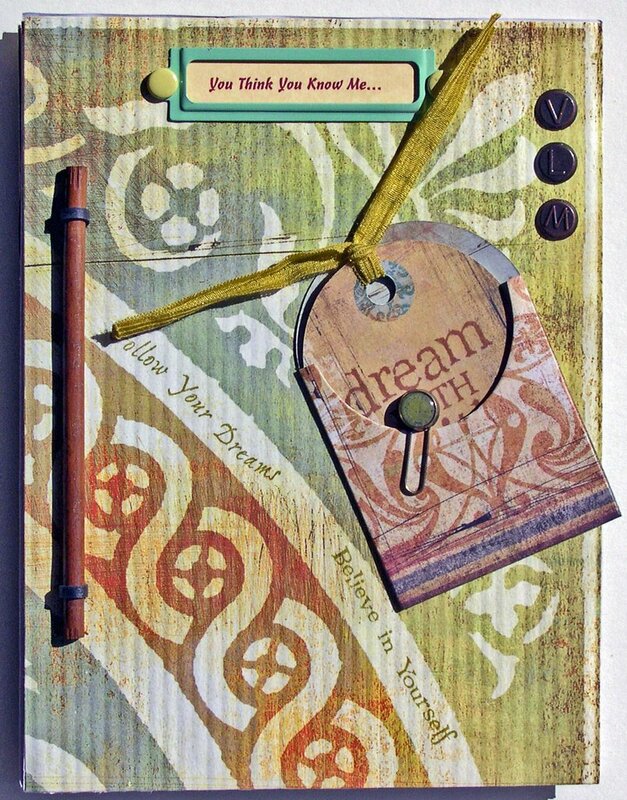 It is all about making a journal that explores 10 different emotions. I am (of course) a bit behind, but Shimelle also tells us to work in our own time frame. 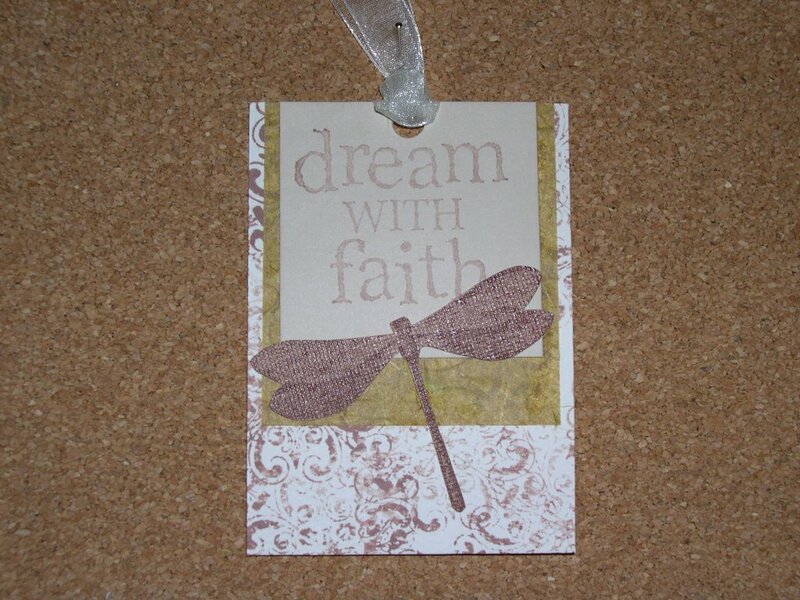 I just happened to find this Basic Grey paper at the scrapbook store. I used cardboard as the base and glued the paper onto the front and back. I stamped on it with some neat stamps and embellished with things I had on hand. In the upper right hand corner are my initials. The binding is stick binding. The size of my journal is 6" x 8". Now I can't wait to get started with the inside pages. 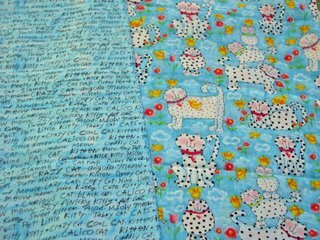 I am going to Quilt Market this weekend with my friends so I may have to wait to start the pages until I return on Monday. It's a fun class! Classes like this always jumpstart my creativity. I think I have been collecting embellishments, paints, etc. for a long time just waiting for that special project. But, today I realized that collections of such things are only passed on, unopened and unused, so I should use them to create beautiful things that I will enjoy today! This is Taylor. She is lying on the floor in my studio waiting for me to throw her mouse. She does like to give her opinion now and then on what I create. Today we decided to make some ATCs (altered trading cards). Taylor is a big fan of Quilting Arts magazine. 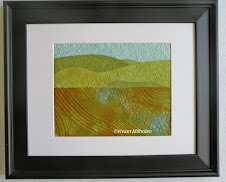 If you want to make some ATC's, go to the Quilting Arts blog . 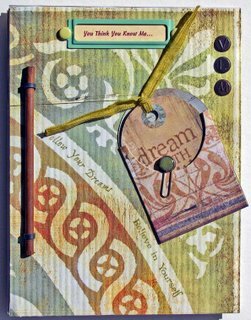 Patricia Bolton has great instructions (March 2006) for making some beautiful ATCs on the blog. So, I thought I would give it a try. The ones I made today are made with cardstock as the base and I used glue instead of Wonder-Under. 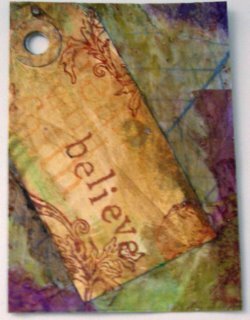 Usually, I make ATC's with fabrics but not this time. I even got to use my Dr. Ph Martin watercolors! Careful not to squeeze the dropper too hard!...don't ask. It only takes a tiny drop of the Dr. Ph Martins to go a long way! But, not a problem, I always wanted purple spots on my cutting mat. This is the tool that I use to audition where I want to cut. I got it at a workshop I took at European Papers in Columbus, OH. I think this one is my favorite. It still needs some ribbon or yarn. What I love about these is that each one is different. 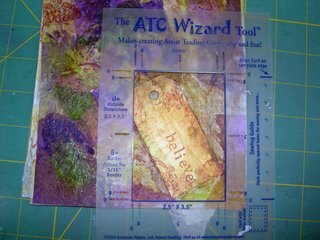 ATC's are 2 1/2" x 3 1/2"
This is a picture of one of the little ATCs (altered trading card) I recently made for a swap. You can't see in the photo, but the dragonfly has a tiny bit of embossing powder on it. The gold is mulberry paper and the background is overstamped. 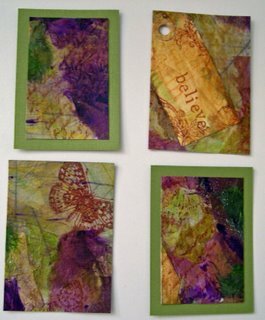 Making ATCs can be addictive but fun. It also allows you to try out new techniques using just a tiny bit of supplies. Tomorrow, I am making the trek to a craft store to check out their supplies. This is Taylor. Isn't she adorable? She loves to play with her mice and loves to sleep on quilts. Isn't that really what quilts are for? Here she is sitting on a stool near the computer reading my blog. She loves to read over my shoulder...only she understands all the tech computer terms because she was raised by computer wizards. She just informed me I need to re-boot my computer because it is running too slow. Here she is playing with her mice. As you can see, one of them is quite dead. She loves the crocheted one the most because it keeps coming back to life. We have Taylor now. She is so sweet! This morning I am sitting at the computer and she comes over and starts "talking" to me. I look down and she has her tiny mouse. She wanted me to play the "throw mouse up the stairs and she will retrieve it" game. So I did. I stand at the bottom of the stairs and throw her mouse up the stairs and she fetches it and brings it right back to me for another throw. We do this until something else captures her attention. Right now she is sitting next to me with her "now dead mouse". Funny how the mouse keeps coming back to life. I tried taking pictures of her but she moves so fast I don't have many. She is so much fun! She has really settled in well and acts like she has always lived here. More later on Taylor Cat. Wow, I realize I haven't posted in a while. Our daughter was visiting this week and we were busy most of the time. We had a great time. We went shopping, to the movies, out to eat and one day we went to The Waterford Fair in Waterford, VA. It is so awesome! It is a historical town built by the Quakers. Most of the homes were built in the 1700's. We got to tour 6 of the homes. I love seeing and hearing how they lived during that time. The craft fair was so upscale! 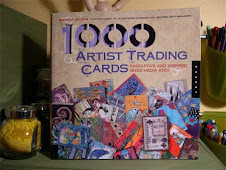 Lots of artisans there. http://www.waterfordva.org/calendar/fair/fair.shtml This is the website for the town. It was raining cats and dogs that day and good thing we drove the SUV. We parked in a farmers field and mud was the main ingredient! We actually slid down the hill. But we had a great time! In fact, Vern and I went the next day after we dropped Traci off at the airport. He enjoyed it, too. We got to see 5 different homes. He especially enjoyed the map maker's maps. The movie Traci and I saw on Thursday was "The Guardian". What a great movie! But it's one of those when you think "this is the end, wow, how great!" it keeps going and I didn't like the ending. This is the weekend we are picking up Taylor. I bought her new toys. One is a mouse that rattles, crinkles and has such a cute face. I see that it has catnip in it, too. 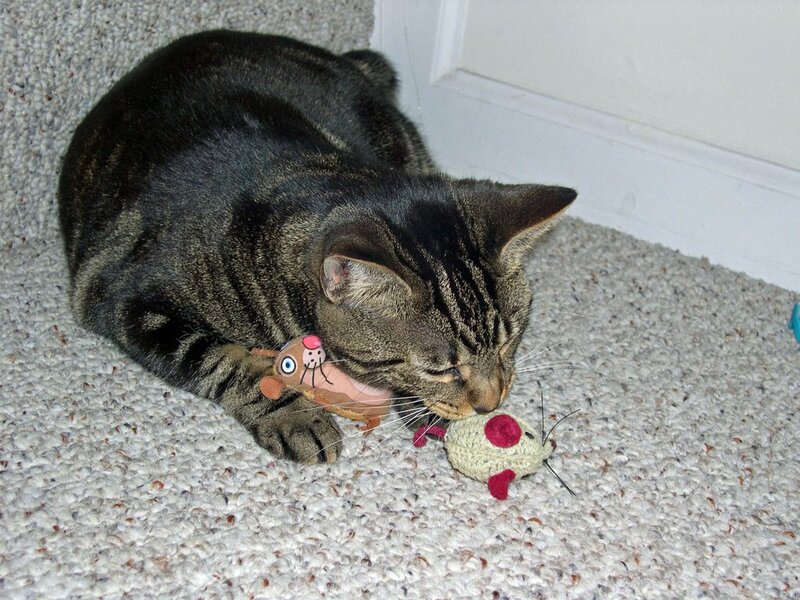 I am making her some new toys that are stuffed with batting and have long yarn on the ends....they are fish! I hope she likes them. I have to introduce her to the color "pink" as she is use to living with two guys. The only pink she sees is when one of their girlfriends visits. 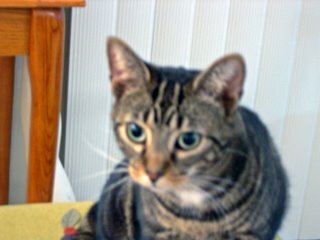 Tomorrow, I am going to look for a nice cat carrier for her...hopefully it will be pink, too. Ok, enough talking tonight. Tomorrow, I will try to post pictures of the new ribbons I just bought at G-Street fabrics. 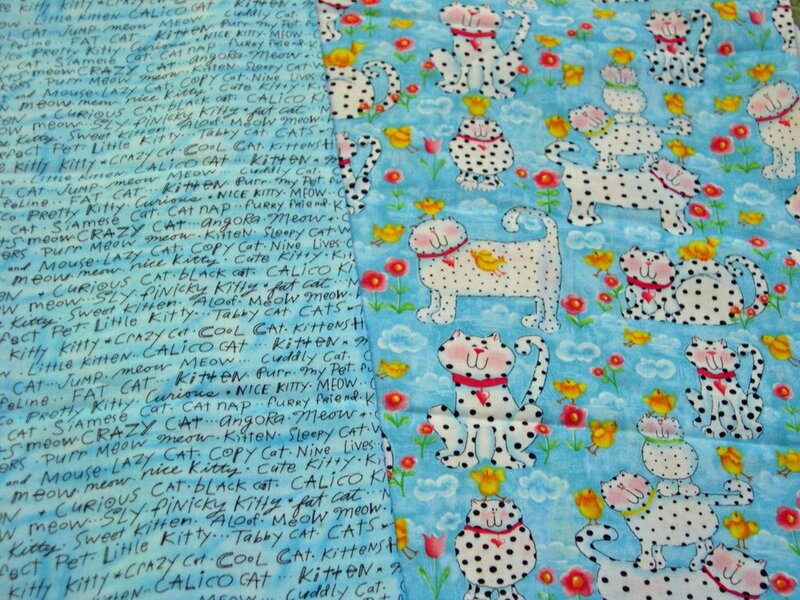 This is the new fabric I just bought at the Sewing & Quilt Expo in Chantilly, VA. (click on image to read the cute cat words) It is for a new quilt that I am making Taylor! 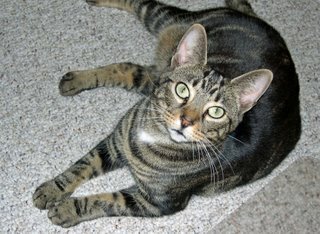 Taylor is a very sweet, adorable cat. We get to adopt her soon...in two weeks. She currently lives with my son and his roommate. They are both moving and won't be able to take her so we are happy to have the privilege to do so. (Of course they can always come visit her) She really loves quilts and she will have her choice of many at our house. We are anxious to see her again. She loves to be held like a baby and chases paper balls and carries little stuffed mice around. She will have lots of room here to play and will be cuddled all the time. She is loved and will continue to be loved at our house. Whatever she wants....I already have two new stuffed mice waiting for her. I will try to get a picture of her soon and post it here.